The WolfTrack System is a collection of tools and software technologies that we use to monitor and manage our clients' networks and computer information. Some parts of WolfTrack were designed by our own Network Engineers and custom-written by our own Software Developers. Other parts of WolfTrack are based on IT Automation and Network Management software technology from Solarwinds (a leading provider of network management technology for IT Service Providers) and ConnectWise (a leading provider of Professional Services software for IT Solution Providers). The following provides a brief summary of some of the technologies, features and managed services that we provide to our clients using the WolfTrack System. For more details, please contact us. All Service & support requests from our clients are tracked and documented through the WolfTrack system – the problem, the solution, and everything in-between. WolfTrack allows us (or you) to create “service tickets” for new support requests; provides work queues to organize, prioritize, manage open service tickets; document solutions; and close service tickets. Clients can open a new service tickets via telephone, email or the web portal. Our IT Helpdesk & Support Team can respond faster (which helps reduce your cost), using the powerful SpeedSearch knowledgebase in WolfTrack. We can quickly recall past support tickets, problems, resolutions, etc. – all to help our clients get what they need, faster. Using WolfTrack, we track and document your software license information, including: vendor (i.e. Microsoft, Symantec, GFI, SonicWALL, Adobe, etc. ), software products licensed, number of licenses, installation key codes, and maintenance/support contract expiration/renewal dates. We renew maintenance/support subscriptions at the scheduled time – so that our clients can be confident their agreements won’t expire. Copies of all license certificates and renewals are always provided to clients, and periodically a License Summary Report is also provided. Our WolfTrack Network Operations Center (NOC) consists of server hardware and software running at our office. Our NOC integrates with a small, lightweight application (called the “WolfTrack Agent” software) that is installed on each server and each desktop/laptop for our clients. The WolfTrack Agent software communicates with the NOC on a regular basis – via a secure Internet connection – to send and receive data, receive commands and instructions, and provide feedback. After the initial installation, a “W” icon appears on the system tray, letting you know that the WolfTrack Agent software is installed. The WolfTrack Agent Software allows us to pro-actively monitor servers, desktops and laptops (located in your office, as well as those in the field). When any significant events occur, an alert is generated, and we are automatically notified. 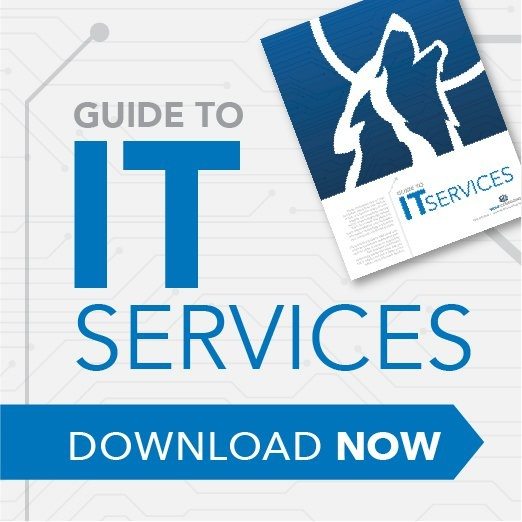 Some examples include: tape backup failure; disk image failure; unexpected computer shutdowns; disk drive errors and warnings; low free disk space; stopped Services; out-of-date virus definitions; critical event log entries; power-related events; and more! With this information, we are able to pro-actively address the issues – thus allowing us to prevent/minimize the problems, unexpected downtime, and business interruptions that can occur if those issues go undetected. Using the scripting technology in the WolfTrack System, we are able to instruct the WolfTrack Agent software to regularly perform pro-active maintenance tasks and performance optimization tasks for servers and for desktops/laptops, during off-peak hours. A few examples include: reboot desktop PCs; delete temporary operating system files; delete temporary Internet files; perform disk defragmentation (“defrag”) operations (to optimize file storage and improve disk speed); analyze hard disk drives and query S.M.A.R.T. drive status (to detect and report on indicators of reliability problems and predictive failures). By performing these types of tasks regularly, we improve and optimize the performance of servers and desktops/laptops – enabling Windows and the computers to work as fast as possible. By performing these types of tasks in an automated fashion, we are sure they occur on a regular basis, and we decrease the need to spend our consulting time on manually performing these tasks during our scheduled onsite visits. This allows our onsite Network Engineers to have the opportunity to focus on higher-level tasks. We can use the WolfTrack technology to make certain types of global changes to many servers and desktops/laptops, all at the same time. Some examples include: Making registry changes to all servers or PCs to address a newly published vulnerability; installing software applications and version upgrades (such as antivirus, Adobe Acrobat, Java, disk imaging); installing Service Packs for Windows Servers, Windows desktops (XP and Vista), and Microsoft Office. These kinds of tasks can be scripted and scheduled to occur during evenings/weekends. This reduces the business interruptions caused by multiple computer reboots related to making these changes during our scheduled onsite visits. And it can free-up some of our time during the onsite visits so the Network Engineer can have the opportunity to focus on higher-level tasks. The WolfTrack System includes remote control and file transfer capabilities. This allows our IT Helpdesk to securely connect to your server/desktop/laptop whenever you require support – with fast connection times and simple end-user connection procedures. Keeping track of all the network hardware and software (“assets”), and the constant changes that occur, can be a daunting task – and it gets more difficult as the network expands beyond the walls of your organization to laptops, remote offices and even employee home-offices. The Asset Management feature of the WolfTrack technology solves this problem by providing comprehensive auditing and reporting, of hardware and software, for servers and desktops/laptops. The WolfTrack Agent software automatically audits and reports information about each computer’s hardware to the centralized database at our Network Operations Center (NOC) on a recurring basis. Examples of hardware information collected include: manufacturer; model number; serial number; motherboard type; memory capacity and memory installed; processor; hard disk drive type, size and usage; adapter cards; network configuration information; and more! The WolfTrack Agent software also automatically audits and reports information about the software installed on each computer on a recurring basis. Examples of information collected include: the name and version of applications installed; installation path; Microsoft product key codes; listing of Add/Remove Programs; and more! This information is helpful to our clients in many ways. The WolfTrack Asset Management technology provides us with the ability to completely automate all system audit functions. By performing these auditing tasks on a recurring basis, we keep asset inventories up-to-date and accurate at virtually all times. By performing these auditing tasks in an automated fashion, we are sure they occur on a regular basis. It can be a very difficult and time-consuming process to keep every server and every desktop/laptop up-to-date with the latest Microsoft software patches. Using features of the WolfTrack System, we are able facilitate “Patch Management” – the process of discovering, identifying, downloading and installing Windows Updates. Automated and recurring background scans assist us in quickly knowing which patches are available/missing and which patches are installed – for both servers and for desktops/laptops. We periodically provide audit reports to you showing the patch status. The WolfTrack System provides us with a centralized database where all computers, for all of our clients, can check to see if a particular patch is “Approved” for installation, or “Denied”. We mark updates as Approved or Denied based on results of our internal testing, as well as postings and feedback available to us in public and private newsgroups. Once WolfTrack knows the “patch status” of a computer (from the daily background audit), it checks to see if any of the missing patches have been approved for installation. The WolfTrack Agent software periodically deploys the “Approved” patches to the servers/desktops/laptops, while simultaneously blocking any “Denied” patches from being installed (preventing patches that we know introduce problems from being automatically installed). Patch installations are scheduled to occur during off-hours, which helps to reduce the business interruptions caused by multiple server reboots related to applying patches during business hours. If desired, our clients’ in-house Network Administrators can be given the ability to login to the WolfTrack system (web-based interface) and securely access certain modules and report information (for only their computer systems, of course). Introductory training & review classes are offered periodically. A wide array of reports are available, including: machine summaries, hardware inventory, software installed, patches installed/missing, disk utilization, performance monitoring, and more. These reports can be run at any time by Wolf Consulting staff, or by in-house Administrators via the User Portal. Additionally, several management-level reports are automatically emailed to our main contacts at each client on the first day of each month. Find out how our WolfTrack System can help your business succeed.